The best ever touch screen operating system by Microsoft; Windows 8 has been creating a buzz in the market since its conception. Most of the Smartphone and tablet manufacturers are now turning their head towards this OS and replacing Android with this new revolutionary OS. With its increasing demand, the number of applications is also growing significantly. This OS has a wide variety of crucial tools, services and plug-ins along with multimedia tools, games, and chic designs that allures the users indeed. There are few crucial plug-INS that are quite useful for all the bloggers. Please scroll down to know about the plug-ins, especially if you are a blogger. 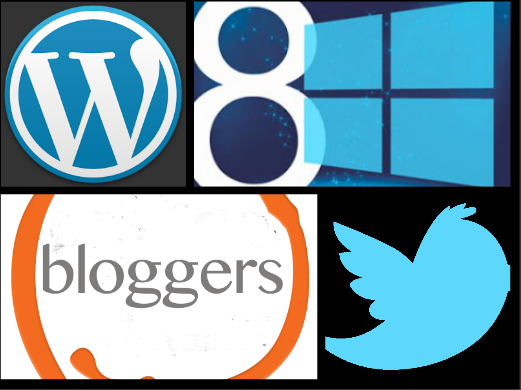 Bloggers have a great scope to promote their personal blog through popular social site, Twitter. This would be a great idea because followers who are interested in your micro blogs will definitely appreciate your larger blogs. This plug-in will enable the bloggers to promote their blogs on Twitter an even allow them to make use of several useful functions and features that are generally available on desktop websites. This is another popular plug-in amongst the bloggers these days, owing to hype of WordPress CMS platform. This plug-in will enable your users to access your WordPress blogs on their tablet PC and Smartphone with ease. Bloggers can even make changes in posts and edit the comments easily with the use of this application. This plug-in is quite effective for bloggers as it enables them to view the pictures, access the files and even watch videos with a simple tap. Saving, editing, and opening files from other Windows8 application is also easier with this plug-in. This plug-in is intended for bloggers who want to stay tuned with other fellow bloggers. This plug-in will enable the bloggers to stay connect with other bloggers online through Instant Messaging facility. This is a specialized analytical plug-in for bloggers that can be used by them on their tablet PC or Smartphone. This application allows the bloggers to access all the features that they have looked in Google analytics and also they can access the data against time periods like, daily, weekly, monthly and yearly. This is really an exceptional plug-in for bloggers as it helps them to make notes with the use of their Smartphone. The bloggers can easily categorize them according to their needs. The notes stored can also be shared through cloud with other bloggers. Though there is no officially released Facebook plug-in available today for Windows 8, but some developers have already launched third party Facebook plug-in for bloggers and named it Facebook Touch. This is an comprehensive, fast and simple plug-in that allows the bloggers to enjoy the touch experience of Facebook on their Windows 8 Smartphone and Tablet PC. It is an affiliate network that has been launched by Google. With this application bloggers can easily put ads on their blogs and websites and get paid for each click on these ads done by visitors. This is quite amazing plug-in for bloggers today as it allows you to write blogs offline on Smartphone and publish it whenever you are connected to internet. Bloggers can even share images, videos and content with the use of Windows Live Writer. This is a revolutionary, customizable Google RSS reader plug-in specifically intended for Windows 8. Unlike other plug-ins, this a paid application with list and classic based design. This plug-in is now available with in-built Pocket Sharing feature and Instapaper, thus enabling the Tablet users to access articles and news on the go with just few simple clicks.